METHANE: Over half of what’s in the landfill is compostable. Most folks assume these materials simply break down into dirt. In reality, food waste in a landfill puts off methane gas, which is 120 times worse than CO2. LEACHATE: The water from food mixes with everything else in a landfill, producing a toxic sludge called leachate, which can get into our waterways and do some nasty stuff. SPACE: Food waste shortens the life span of a landfill. Building new landfills is costly, and finding space for them is incredibly difficult. The stuff we can take at our commercial composting farm is much different than what you can do in your backyard. That's because we have really expensive equipment that filters out contaminants, we flip piles at the right time to increase oxygen levels, and we mix it with the right ratio of carbons and nitrogens (plus our soil crew are just general BA's) to get the right nutrient-dense mixture. • ALL FOOD: Fruits, Vegetables, Bread, Juice, Soup, Soda, Tea, Egg Shells, Coffee Grounds, and much more! We sanitize the totes: During warm months, we use a high-powered, high-heat can washer to sanitize totes. Our process captures the water, which means we clean on-sight with no mess. During cold months, we replace plastic bag liners each week. Animals can’t get in: Because of the way the lid sits on the lip, animals can’t get in. But if prefer, we can always lock or clamp the lid shut. It works! : From schools, offices, to restaurants, we’ve never had an organization cancel because of an issue with rodents, bugs, or smell. If you'd like, you can try out composting free for a month! 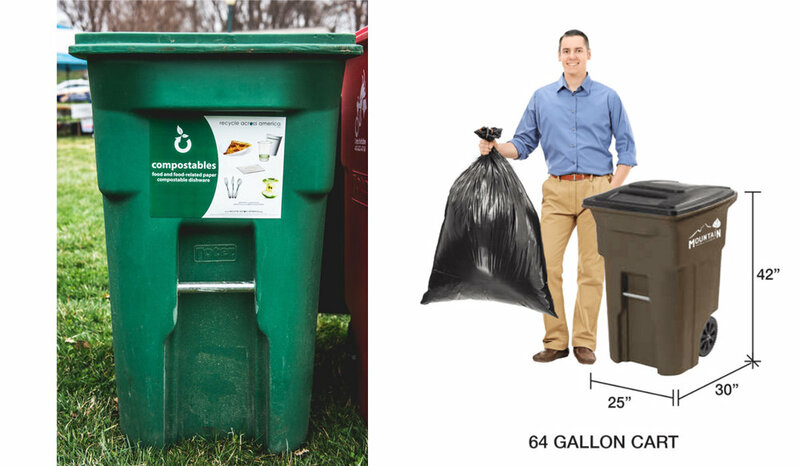 With no strings attached, we'll drop off a 64-gallon tote (pictured below) and let your team see what they think. Along with that, one of our Sustainability Consultants will hold an orientation with your employees or community that teaches the 101 on how composting works, why we compost, and what is and isn't compostable. We'll even throw in a quick and free audit to determine what type of waste materials you're producing, the best solution you have for your waste, and what is and isn't compostable out of those items. If you like the service, keep on composting and we'll quote you a long-term plan. Turns out if you're using paper straws, you're not doing the earth much of a favor if you AREN'T composting them. This video explains why, and what you can do about it.